For the next two weeks I’ll be blogging from Rwanda where, I will be joining fifteen other participants in JRC’s third service delegation to Africa. We’re returning to visit and volunteer with our good friends at WE-ACTx, a visionary NGO that works to increase women’s and children’s access to HIV testing, care, treatment, support, education and training throughout Rwanda. We’ll also spend time with CHABHA, another important NGO that funds and supports orphans and other children affected by HIV/AIDS in Rwanda and Burundi. You may remember that our last trip included a visit to an infamous massacre site as well as conversations with individuals who briefed us on the latest efforts to heal Rwandan society in the wake of the devastating 1994 genocide. While it has not been a straight path (nor has it ever been) I do believe that the Rwandan example has much to teach the world about how to move past tribal enmity and the tragic legacy of colonialism. I’m particularly thrilled that this time around our group will include six teenagers, who will be spending significant time with Rwanda youth programs supported by WE-ACTx and CHABHA. As a father of a teenager who attended our last African delegation, I can personally attest that these kinds of service trips can be genuinely life-changing experiences for young people. As before, I’ll be posting regularly about our experiences If you’d like to read my posts from our last delegation, go to the Categories drop-down menu on the right and click on “JRC Africa Trip 2008.” Reading through these posts brought back some powerful memories for me and I’m eager to create new ones on our most current trip. 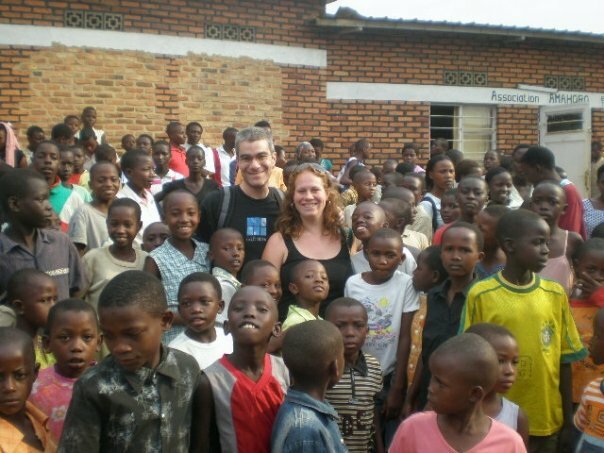 This entry was posted in Africa, Global Activism, Health Care, HIV/AIDS, Human Rights, JRC Rwanda Trip 2012, Poverty, Rwanda, War on July 4, 2012 by Rabbi Brant Rosen. Godspeed on your trip, Brant, along with the other members of JRC’s delegation. I appreciate the valuable work WE-ACTx and CHABHA have done and are doing, and I hold dear memories of my time in Rwanda. Have an amazing trip. I hope it is meaningful and eye-opening and full of human connections and lots of good stories. I’m sorry not to be going this time around. So honored to be in the photo (and look how much hair I had then!:). Safe travels!